Euler’s life and his contributions to mathematics have made it possible for me to explore my passions. His polyhedron formula (2=V+F-E) and Seven Bridges of Königsberg problem laid the groundwork for topology, the mathematical discipline I focused on in earning my doctorate. While he wasn’t involved in finance himself, his constant, (he actually is the only person with two numbers named after him), is the most important number in finance playing a central role in continuously compounding interest, the normal distribution, and geometric Brownian motion (the standard process for modeling stocks). This shows just how far-reaching and influential the work of such a brilliant mathematician can be. After spending years seeing the world through the lenses of mathematics and finance, and having a rare eye disease myself, it was only natural for Euler to play a meaningful role in my art. 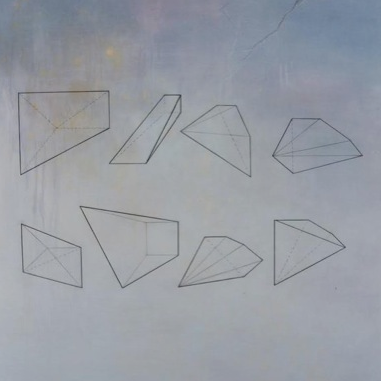 In my artwork, I have explored Euler’s identity, the Basel problem, the polyhedron formula, and the Seven Bridges of Königsberg problem, drawing upon them to analogize or wrestle with various elements of the human condition. 2overcomeaddresses his polyhedron formula (2=V+F-E) and struggles with blindness. If the vertices of the shapes were replaced with circles the word “overcome” would be spelled twice in braille. The formula itself applies to a large class of shapes including the ones in the piece. The moral is Euler overcame eye problems to become a brilliant mathematician. In the Original Art Basel (Miami), the solution to the Basel Problem, π^2/6, is spelled out in colorful braille-based abstraction. The area of each circle represents the value of each of the first 13 terms of the infinite series defining the problem, i.e., the area of the circles approximates the braille number they spell out. The notes scribbled throughout the piece are all relevant to the problem, and its generalization, the Zeta function (an extremely important mathematical function). Recently I created an art series about Wall Street, using my hedge fund trading algorithm as the core aesthetic element and visual backdrop for the pieces. The process to transform the C# code into colorful shapes included e. One of the goals of this series is to show the power of math in finance and the influence brilliant theoretical mathematical minds impact our real world years later. (I also warn that finance doesn’t have the certainties of math so practitioners’ failure to understand the implicit assumptions in these models can have dire consequences in financials crashes.) All of these works point to the impact Euler has had on my art and me. When looking for tools and elements to create pieces with topics as diverse as explaining the rise of Caesar, the interconnectedness of economies, the simplicity of mathematical beauty or overcoming obstacles, Euler’ life and theories have been a rich source for me. So when you are drowning your tax sorrows in alcohol, don’t forget to toast the great man. Nelson Saiers has an art show titled Inside Wall Street at HG Contemporary Gallery in New York City through May 3, 2016.